As a big fan of Mischief Theatre, the first thing I had to remind myself before watching The Comedy About A Bank Robbery was that this wasn’t a play being performed by Cornley Polytechnic and that despite being produced by the same company who gave us The Play That Goes Wrong and Peter Pan Goes Wrong, this particular play really shouldn’t be going wrong at all; something that I wonder if the cast must have been subconsciously thinking about on their preview opening night. However, as one of the posters for the play states in its description, “One enormous diamond, six incompetent crooks and a snoozing security guard. What could possibly go right?” you couldn’t help but wonder. 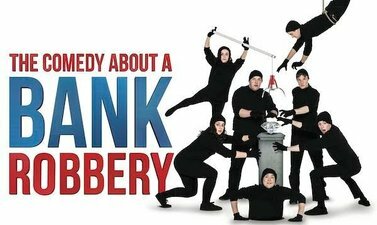 The Comedy About A Bank Robbery takes place in 1950s Minneapolis, USA which was the first thing that surprised me. For some reason I was expecting an Ealing comedy type caper but this is very much set in the States with a definite American movie feel to it which gives the Mischief Theatre company, quite literally, a great deal of ammunition to play with throughout the somewhat convoluted plot which at times was absolutely exhausting to watch and must have required a great deal of energy to play. From the moment the show starts you know you’re going to be in for a fabulous ride with the action providing lots of laughs. Scene changes by the cast were scarily quick and efficient, yet also leaving you holding your breath, wondering whether anything was going to go wrong. Not only did they not go wrong, (okay, maybe something fell of a desk at one point - doesn't really count for a preview) the cast also managed to sing their way through many of the scene changes, complete with full acapella arrangements . Yes, that’s right, not only can these guys do faultless farce and comedy, they can blooming well sing too! Nancy Wallinger, in particular, has an amazing set of pipes, which earned her a spontaneous round of applause at one point. Chris Leask also has a marvellous moment playing 3 different characters having a fight with each other, earning him a well deserved round of applause from an appreciative first night audience who were full of laughter throughout. The core players of Henry Shields, Charlie Russell, Dave Hearn, Greg Tannahill, Henry Lewis, Jonathan Sayer, Nancy Wallinger and Chris Leask were all on top form. Jeremy Lloyd, marking his West End debut, also gave a brilliant performance as Officer Randal proving himself to be a worthy member of this talented troupe. There is one hilarious and ingeniously devised part of the play, which had most of the audience doing double takes, involving the robbers sliding through an air duct and looking down on the bank's offices with Mr Freeboys and Warren (Henry Lewis and Jonathan Sayer) at their desks, which was complete brilliance and really needs to be seen to be believed. With this new production, Mischief Theatre have not only brought themselves up to another level of comedy writing, they have completely raised the bar with the level of farce that British theatre has yet to witness. 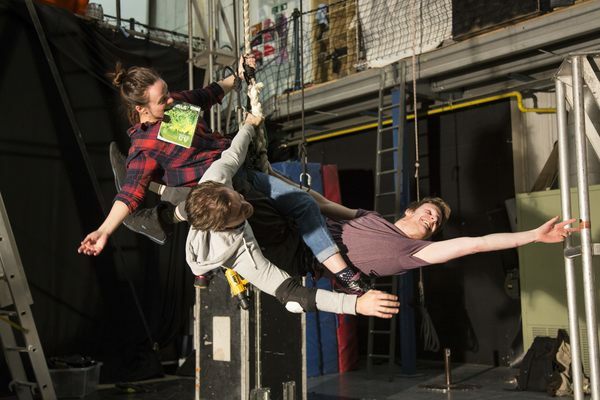 As well as the usual slapstick, mistaken identities, infidelities and double-entendres one expects from a farce, the cast have come up with some outstanding physical theatre and stunts aplenty which leave you completely astounded and gasping with disbelief.